Yes! 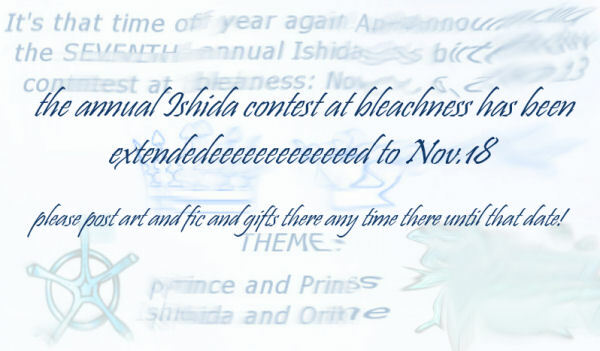 The seventh annual Ishida birthday contest has been extended! Due to the date sneaking up on everyone, LJ being dead (as well as dysfunctional and not sending out notices to mods), we're extending the celebration through until MONDAY NOVEMBER 18. Please continue to submit posts ANY TIME OF NIGHT OR DAY during that time, according to the original rules (laid out here: http://bleachness.livejournal.com/745900.html). We'll adjust prizes according to the number of entries. If you submitted an entry and it didn't show up on the community on Nov. 6, please try again! Thank you for your lovely submissions so far--Eny <3 Lumi <3 and Mezzo <3, gooooosh, if we only were blessed with your lovely works, the fandom would be rich indeed! I appreciate your devotion to this pair more than you could know! I've been so busy with work and stuffs lately and I will comment on the entries soon--my dear cat Ichigo got in a nasty door-slamming accident (his third time to get stitches, NOT counting the time he got neutered, in his young three years of life--he really has a tendency to get all banged up just like his namesake) and HE'S NOW MINUS TWO INCHES OF TAIL but still handsome and such a trooper and being spoiled with tuna. He got his bandage off today, and I've had a little time to make this announcement and PLEASE PLEASE PLEASE, EVERYONE, CARRY ON. POST MORE STUFF. Make posts about Ishida (I have one in mind next time I get a break from grading) or do funny manips or ANYTHING. The celebration goes on until my birthday (the 19th) and I want to feel like I enjoyed Ishida's birthday right this year! Ichigo eating tuna in the name of the Quincy! 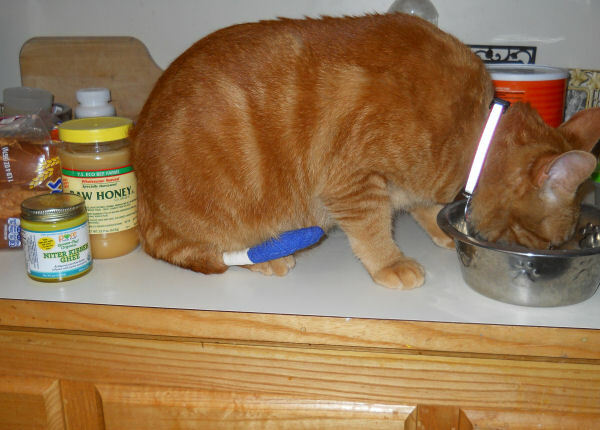 HIS BANDAGE WAS QUINCY BLUE! PARTY ON! Thank the Lord that your cat is fine <333 . He looks healthy despite such traumatizing accident :P . Poor baby it must've been awful *cuddles it*. I'm glad I have more time to finish my drawing Deb, thank you so much for the extension (and I'm sure many would agree). I'll make it worth the wait ^__^. Stupid LJ!